The 2TB Elements Desktop Hard Drive from WD is a high-capacity desktop hard drive with a no-frills design. The disk is housed in a compact metal enclosure, and boasts the ubiquitous USB 2.0 interface. The drive is preformatted for use in Windows, and can be reformatted for use with Mac OS X using Apple's Disk Utility application. The drive is ready to use right out of the box -- you won't have to load any software from a CD to get the drive to work. It is an excellent option for users who would like to add storage capacity to their system. 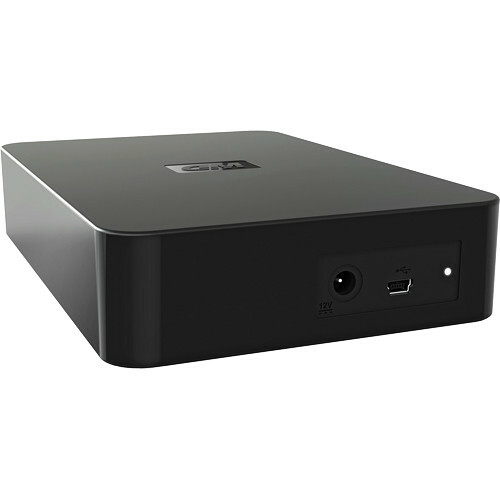 Box Dimensions (LxWxH) 9.0 x 6.2 x 4.9"
2TB Elements Desktop Hard Drive is rated 4.6 out of 5 by 549. Rated 5 out of 5 by Anonymous from Great external hard drive I bought this hard drive for my sister and it really impressed me. I myself was using a Seagate FreeAgent, which is thin and stylish, but makes quite some noise. Because I was fairly disappointed by my disk, I decided to buy my sister a WD, even though it is not as attractive as the FreeAgent in eye. To my surprise, the form factor of this disk is actually much smaller than FreeAgent; and it is so quite that sometimes I just forget to turn it off. This disk is not perfect though, first, I really want a power switch. Clicking the unplug icon turns it off, but to turn it on again you need to unplug and replug the cable. Second, the indication light is on its back and difficult to see. Rated 5 out of 5 by Anonymous from Good at 6 months Use for backup of a variety of file sizes, transfer speeds are acceptable, I think my laptop hard drive is limiting speed. I've had 3 of these for 6 months, one of which has been through some rough handling, and they're all still fine, but I only plug them in when backing up so they haven't seen much run time. Have a light on back that blinks when in use, but easily covered up with tape or whatever if that bothers you. No on-off switch but I've never used the one on my HD that has it. I unplug when not in use and cycle which drive is backed up to, the cheap but slower and more effort-requiring version of a RAID array (with no controller to fail either). Rated 5 out of 5 by BBQ Spareribs from 2TB Elements Hard Drive is a winner. The great thing about the 2TB Elements Hard Drive is that it works really well with a Mac. There aren't many steps involved in getting the hard drive compatible with Mac's time machine. I use this product to back up all the material on my laptop which is quite full since I am always doing video projects. I cannot say that there are any bad things about this hard drive. Also the price for this hard drive is a steal. I thought I would have to spend a lot more money on finding a hard drive that is compatible with the Mac but instead I felt I got a bargain when I purchased the 2TB Elements external hard drive. I would recommend this hard drive to anyone who has a Mac. Rated 5 out of 5 by Fishie from Perfect drive for backups I bought this drive exclusively to backup my computer on a regular basis. What I am amazed about this drive is how small and light the case is. I've had other external drives that were much heavier and bulkier.Pros-Great value. I've seen 1TB drives go for what B&H charges for this 2TB.-It's a Western Digital. I've never had one fail on me yet.-Small and light. Fits into my fireproof suitcase safe easily.-Plug it in and go. It's already formatted for NTFS.-Got it from B&H ....Cons-I wish it had an LED on the front to let you know it's on. There is a light on the back but that doesn't do me any good.So far I am very happy with my purchase. I highly recommend it! Rated 2 out of 5 by Anonymous from I think it is slower than the 1.5TB I purchased the 1.5TB version of this drive model maybe ten months ago and have been very happy with it. I recently bought the 2TB version and have been experiencing some problems - I am concerned it isn't really adequately 'fast' for playing/encoding video files, despite its advertised usefulness as a media drive. I'm not sure I'll ever know whether or not this is what's been causing problems for me, so I feel I wouldn't have better insight with further usage time, frustratingly. But my impression is that video files that played fine from the 1.5TB model aren't playing smoothly from this 2TB one. I recognize that other factors could be at work instead, but I am disappointed with the 'vibe' I'm getting. Take it for what it's worth -- maybe not much, but maybe something. Rated 1 out of 5 by Steve from Disasterous I bought this drive to back up important client data for long term storage and retrieval. I repartitioned it for a my Mac formatted to be sure. After transferring over 1tb of data, I checked the data for integrity, all was well. Deleted the data from my main drive, shut down and went to bed happy in the knowledge that my data was safe... Reboot; Drive not recognised. Read only status when looked at the drive through a utility. No Partition Map. Won't mount. Can't do anything with it, tried various machines and configs... DON'T Buy these drives if you value your data! Rated 5 out of 5 by Paul from attached to my asus rt-n56u router I've attached this external drive to my router (asus rt-n56u) and it works fine. I would caution users that speed in not a strong suite for this drive. I have 1 Gigabit connection throughout my house and it is still a bit pokey. I can stream videos from it with no problems. However, when i was uploading those huge video folders from another NAS drive it was somewhat slow. I believe it has a WD green drive in it so those arent known for being all that speedy. In my application of the drive however as a NAS file server (home network archive of videos, pictures, music, work documents) it works like a champ. Rated 5 out of 5 by Anonymous from Great value! This product is exactly what I was looking for. I needed more storage space, and this one is simply the best for your money. I am a college kid on a budget, so I shopped around quite a bit before deciding on this one. I have bought WD and Seagate before, and WD is definitely one of the best. It's a very quiet drive, and just stays plugged in on stand-by, and wakes up very quietly when you need to use it. Simple plug and play as well. It doesn't have a power switch, but I own or have owned drives with switches, and honestly it doesn't really make a difference to me. I would recommend this drive.